Can This $181 Billion Fund You Have Never Heard Of Succeed At Playing The Long Game In Life Sciences? Traditional life sciences investors have made lots and lots of money from recent multi-billion dollar exits like Receptos, Alios and Acerta. But lately I’ve noticed a different life sciences investing strategy, one closer to the way social/mobile/software investors invest. By paying higher entry prices for later mega-rounds in ambitious life sciences companies, including both therapeutics and non-therapeutics companies, these deep-pocketed investors hope to reproduce their earlier successes investing in the likes of Amazon and Tesla. Their capital, which comes without the usual board seats and tight monitoring, is deeply welcome, because it allows these companies (similar to consumer companies like AirBnB and Uber) to stay under the radar much longer than if they would have to file for an initial public offering (IPO). By the time some of these companies finally surface, they may have catalyzed profound change as well as making money. 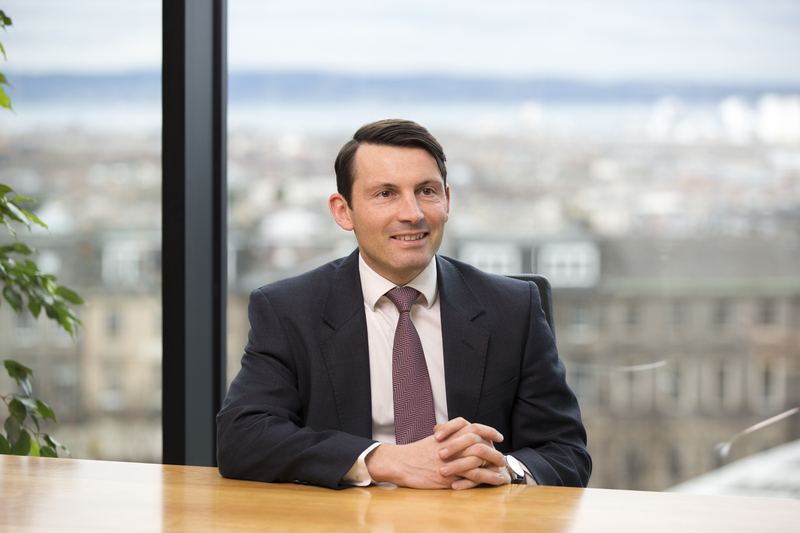 My curiosity about this new approach took me to Edinburgh, to the shadow of its imposing castle, where I got to look at this type of investing through the eyes of one of its top practitioners, an investment management firm known as Baillie Gifford. Never heard of Baillie Gifford? Neither had I when they first approached me in 2015 through a mutual acquaintance at MIT for a friendly chat. It turns out that Baillie Gifford is a global investment fund that quietly deploys the assets of some of the largest pension funds in the United States as well as investing on behalf of many other clients. After doing business for over 100 years, Baillie Gifford currently has 145 billion GBP ($181 billion) under management. “Life sciences companies are an increasingly important part of our research agenda.” That was the essence of what the Baillie Gifford team told me back in 2015. Talk about turning talk into action. Barely eighteen months later, the fund had made six investments in life sciences companies in rounds totaling over $1 billion. The common theme among all of these investments is “growth.” In order to have a chance at making outsize returns – think at least 50% a year if not 100% or 200% – an investor has to bet on a company that can change the world – before the change has happened. Baillie Gifford’s strategy in finding these investments focuses on identifying “mega-trends,” major changes that may be slow to take hold, but once in place, can be extremely influential. Widespread access to the internet would be one example of a modern megatrend. Within biotech, the trend toward ever-cheaper and ever-more-widespread gene sequencing would be another. Trying to make money this way is very different from traditional biotech venture investing. But the size and number of recent such financings show the growing popularity of this model. Recipients include the synthetic biology companies Ginkgo Bioworks and Zymergen; the Google-funded, data-intense companies Flatiron Health and Verily; the Illumina spinout GRAIL; and the medical device company Intarcia Therapeutics. 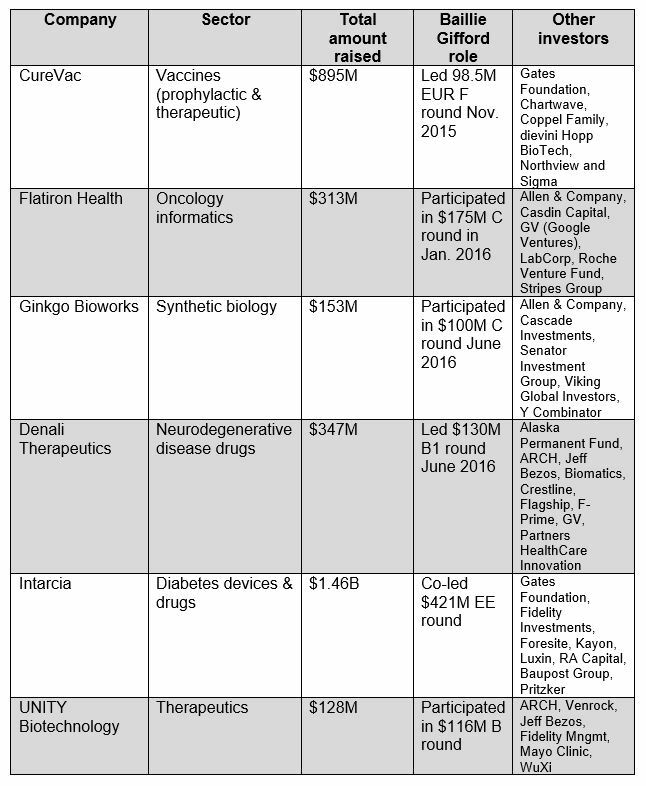 The Baillie Gifford portfolio alone contains Ginkgo, Flatiron and Intarcia along with therapeutics companies CureVac, Denali Therapeutics and UNITY Biotechnology. Baillie Gifford is not the only fund coming into life sciences and healthcare investments with big dollars and long-term views. Domestic US fund Alaska Permanent Fund was a big pre-IPO investor in Juno. More recently, that fund invested in the $61 million Series A round of Cambridge, MA-based biotech Codiak Biosciences and in the $217 million Series A round of Denali. Sovereign wealth funds such as Singapore-based Temasek are also increasingly joining syndicates in biotech companies such as Alzheimer’s therapeutics developer TauRx, also based in Singapore, as well as US-based companies such as gene editing-focused biotech Homology Medicines and primary care-focused healthcare play Iora Health. Based on various analyses my firm has carried out on fund flows in this sector, I expect other sovereign wealth funds to increase, in some cases significantly, their investing activity in life sciences and healthcare.